It’s important to know what to expect before you get veneers in Westland, MI. Interested in hiding those minor dental imperfections to get a straighter, brighter and more even smile? Your Westland, MI dentists Dr. Dennis Aylward and Dr. Brent Carey can help with dental veneers. But before you decide to take the plunge, find out a little about what getting veneers entails. Coming in to see your dentist in Westland about veneers is the first step in figuring out if this is the right cosmetic treatment for you, or if there are other treatment options that would work better for your smile. Now is the time to talk to us about what you are looking to fix about your smile so we know if veneers can give you what you need. 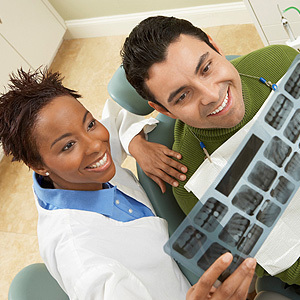 We will examine your smile to determine what we will need to achieve to give you the perfect smile. We will also want to ensure that you aren’t dealing with any untreated issues like dental caries (cavities) or gum disease, which will need to be treated before you can get cosmetic dentistry. Once we deem you appropriate for veneers you will have your teeth prepared for their new look. Since just applying the veneers directly to your teeth will cause a bulky and unrealistic-looking smile we will need to file down a small amount of enamel to make room for your veneers. Usually, we only need to remove about ½ millimeter of tooth enamel, which is completely painless and won’t even require anesthesia to complete. After your teeth have been prepared then we will make molds of your teeth to send to a lab. These molds will be used to create veneers that match the proper shape and size of your natural teeth. We will also decide on an ideal veneer shade together. During your final visit it’s now time for you to approve the look of your veneers and make sure you are satisfied with them before they are applied. Once you are happy, we will apply special cement between your veneers and your teeth and then use a laser to harden the cement. Now you have your new and improved smile! Ready to get veneers? Then call your dentist at Carey & Aylward, DDS, PC to schedule a veneer consultation right away.